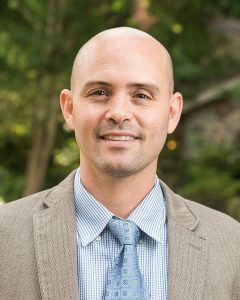 Assistant Professor of Biology Matthew Nelson, Ph.D., was awarded a $324,000 grant by the National Institute of General Medical Sciences, a division of the National Institutes of Health, to conduct research on sleep in Caenorhabditis elegans, a free-living, non-parasitic nematode. His research deals specifically with the mechanics of how the roundworm enters a sleep state using optogenetics — a technique that modifies cells so they can be controlled by light. Nelson hopes that his research will be a building block for future sleep studies in other species. The grant also provides for upgraded lab equipment and funds graduate students and undergraduate Summer Scholars, who will assist with the research. Kate Molloy ’15 is one of 37 credited co-authors of a promising study on Zika vaccines, published in Science (August 2016). A research technician at the Center for Virology and Vaccine Research at the Beth Israel Deaconess Medical Center-Harvard Medical School in Boston, Molloy measured immune responses in blood from rhesus monkeys which had been immunized with vaccines. 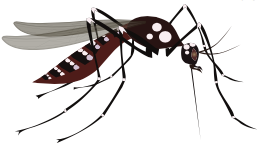 The study demonstrated that three individual vaccine platforms protected the monkeys from Zika, which is a virus spread by the Aedes aegypti mosquito and causes serious birth defects. “The main focus of the lab I work in is HIV,” Molloy says, “but we took on Zika as it became a larger issue worldwide.” Molloy credits her Summer Scholars experience with preparing her to work in the Deaconess lab. 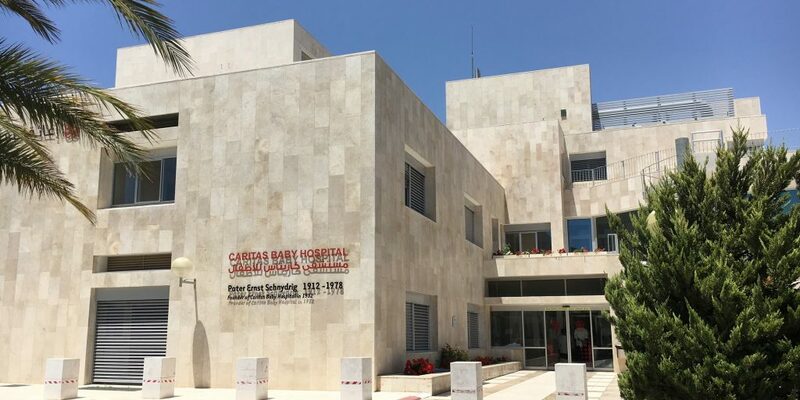 SJU’s Institute of Clinical Bioethics (ICB) has agreed to serve as medical bioethics consultants for the Caritas Baby Hospital, a charity hospital that provides care for almost 40,000 children, many of whom are refugees, in Bethlehem, Palestine. As the hospital’s first international bioethics specialist, the ICB has helped formulate and initiate ethics policies and is providing ethics consults and other services via Skype. The ICB also has a new local partnership with three Aria-Jefferson Health hospitals: Torresdale, Frankford and Bucks County. In these Greater Philadelphia locations, the ICB consultants are responsible for the ethics education of 115 medical interns, residents, and medical and nursing students through formal lectures as well as teaching rounds. Institute director Peter Clark, S.J. ’75, professor of theology and health services, leads the ICB’s engagement with these consultancies. Fr. 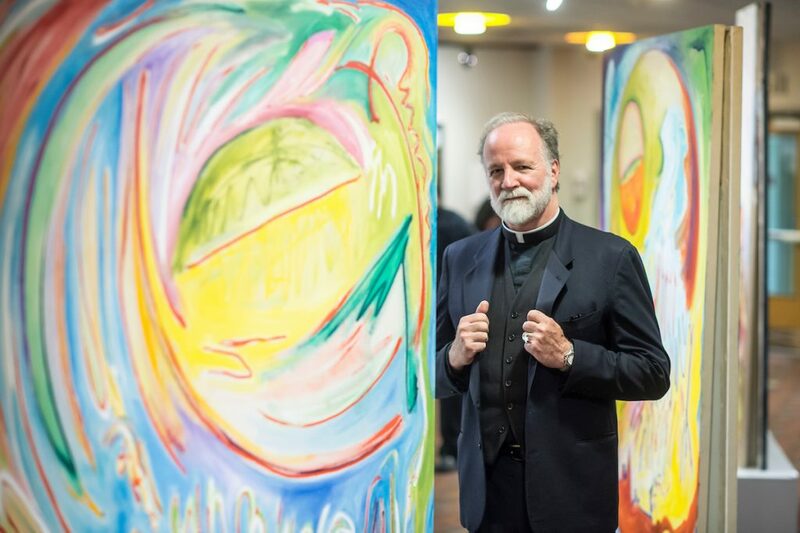 McNally stands with his painting Trinity Sunday, acrylic on canvas, 6 x 4 ft., 2016. In the background is Pentecost, acrylic on canvas, 6 x 4 ft., 2016. From Nov. 7 through Feb. 10, Saint Joseph’s University Gallery featured artwork of 12 Jesuit priests — ranging from paintings and drawings to photography and mixed media pieces — to celebrate the 40th anniversary of “Jesuit Spirit in the Arts.” First held in 1976 by curator Dennis McNally, S.J., professor of art, the original exhibit also showcased artwork of Jesuits and others involved in fine arts at Jesuit colleges and universities across the world. The anniversary celebration also marked Fr. McNally’s 40 years of service with SJU as founder of the University’s art department and department chair for 22 years. Many of his paintings were displayed in a special portion of the exhibit in Merion Hall. Also displayed were photographs and poems by University Professor Nicholas Rashford, S.J., the University’s 25th president. Emily Bilyk ’16 is one of two recipients of the inaugural full- tuition Mason W. Pressly and Oscar John Snyder Scholarship to attend the Philadelphia College of Osteopathic Medicine in 2016, in a class of more than 250 first- year students. The chemical biology graduate is considering a future career in pediatrics. International relations major John McGrath ’18 was awarded a $23,000 St. Andrew’s Scholarship to spend his junior year at the University of St. Andrews in Fife, Scotland, where he is focusing on Middle East studies. McGrath was chosen from nominees representing 18 colleges and universities in the Philadelphia area. Ashley Gerald ’17, international relations major and track athlete, received a Benjamin A. Gilman International Scholarship for $3,400 from the U.S. Department of State to study Mandarin in Shanghai at Fudan University, one of China’s top universities. At SJU, Lena Hunt ’16 (M.S.) researched agroforestry with a focus on pitch pine trees along the East Coast by comparing soil and environmental types, rain conditions and vascular anatomy to earn her master’s degree in biology. In September, Hunt took the skills she learned in Philadelphia to Senegal as a Peace Corps volunteer for 27 months. Biology majors Vincent Pepe ’17 and Marisa Egan ’18 have been named recipients of American Society for Microbiology (ASM) Undergraduate Research Fellowships. Each fellow receives up to a $4,000 stipend and funding for travel expenses to the ASM Microbe Meeting in June in New Orleans, Louisiana. Both Pepe and Egan, a McNulty Scholar, have conducted ongoing research with faculty through the Summer Scholars Program. Last September, Katherine A. S. Sibley, Ph.D., professor of history and director of SJU’s American studies program, served as a panel participant in “Forces for Action: First Ladies in American History,” which is part of the distinguished series “America’s First Ladies: In Service to Our Nation,” sponsored by American University and The National Archives in Washington, D.C. The live-streamed event concluded with reactions by former First Ladies Michelle Obama and Laura Bush. Sibley’s expertise on first ladies extends to the recent publication she edited, A Companion to First Ladies (John Wiley & Sons, 2016). 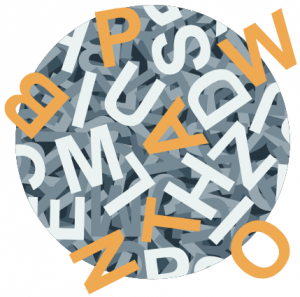 In cooperation with SJU’s special education department, the Pennsylvania Branch of the International Dyslexia Association held its 38th annual conference, “Literacy and Learning Disabilities,” at SJU last October. More than 400 teachers, school administrators, speech and language pathologists, psychologists and parents of students with disabilities attended the event. “The timely and popular topics of the conference focused on reading and writing strategies that will enhance the competency of teacher candidates, newly certified educators and seasoned practitioners seeking state-of-the-art teaching strategies,” says Cathleen Spinelli, Ph.D., professor of special education and event organizer. Schwartz and the attendees of his lecture. 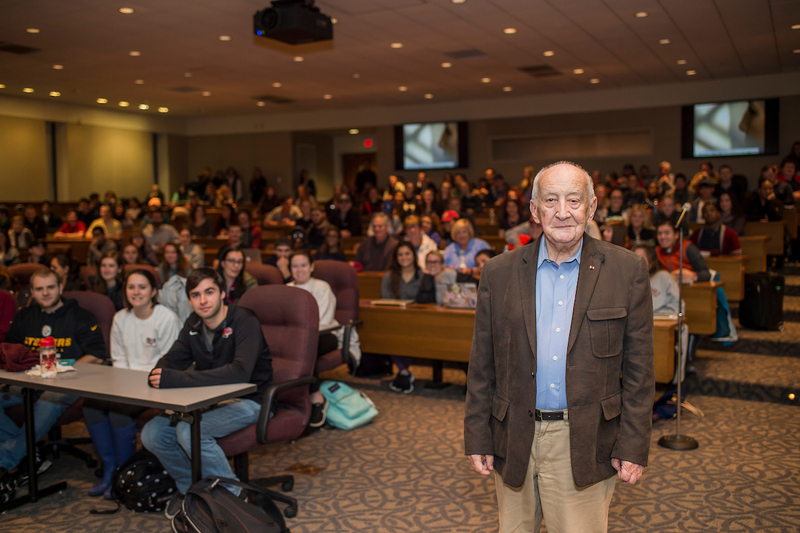 Leslie (Laszlo) Schwartz, a Holocaust survivor, visited SJU last fall to deliver his lecture, “Surviving the Hell of Auschwitz,” which he has presented internationally. At the age of 14 in 1944, Schwartz was taken from his home in rural Hungary and arrived at the Auschwitz concentration camp, where he was separated from his mother and sister, whom he never saw again. Days later, he escaped the camp to join a work crew bound for the Dachau camp in Germany, where he spent two years before he was liberated by the Americans and emigrated to Los Angeles. In 2013, Schwartz was awarded Germany’s highest civilian honor, the Federal Cross of Merit of the Federal Republic of Germany. Philosopher Robin Seelan, S.J., joined Saint Joseph’s University for the 2017 calendar year as the Donald I. MacLean, S.J., Chair, a position held by members of the Society of Jesus who are accomplished teachers and scholars in the arts and sciences. Fr. 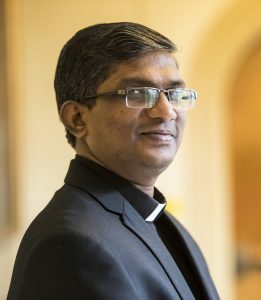 Seelan comes from Chennai, Tamil Nadu, India, where he serves as associate professor of philosophy at Loyola College. At SJU, he is in residence in the philosophy department, and is currently teaching Philosophy of Religions. He will also deliver public lectures. With academic interests in ethics, philosophy of the human person, cultures and yoga, he has published numerous papers and presented at conferences across the world. The MacLean Chair was established in 1987 through the generosity of lead donors Michael J. Morris ’56, Joseph McKinney ’52 (dec.) and the Jesuit Community at Saint Joseph’s. It is intended to emphasize that the University’s Jesuit identity is inseparable from the nest teaching, scholarship and collegiate discourse. The chair is named in honor of the University’s 24th president. Seminars Program of the Onassis Foundation sponsors the visit of eminent scholars from the United States and overseas to university campuses and cultural institutions across North and South America to offer public lectures or mini courses in their area of expertise. 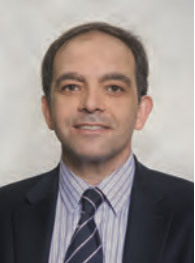 During his appointment, Nikoloutsos taught an intensive mini course titled Ancient Greek Myth in Brazilian Cinema to graduate students and faculty at four universities: the Federal University of Minas Gerais (Belo Horizonte), University of Brasilia, the Federal University of Goiás (Goiânia), and the Federal University of Ceará (Fortaleza). In addition, he was invited to deliver the keynote at two international conferences organized at the Federal Universities of Minas Gerais and Ceará, respectively. Recent scrutiny of the U.S. criminal justice system and issues surrounding mass incarceration have raised criticisms of the responses to violence and trauma stemming from violent crime. To focus on alternate ways to help communities in the wake of violent crime, a daylong series of events titled “Ubuntu Philadelphia: A Forum on Healing and Restoring our Communities” was held at Saint Joseph’s University on Nov. 2. Immaculée Ilibagiza, author and survivor of the Rwandan genocide, presented the forum’s keynote speech. In addition, families of both incarcerated men and women and victims, and formerly incarcerated people who have committed violent crimes and their families came together with the larger community to discuss the personal impact of violent crime as well as the implications it has on political and correctional systems. “We heard amazing stories of overcoming the pain and sorrow of losing a loved one to homicide or a prison sentence from people who have begun a journey toward reconciliation," says Lyons. Biology graduate and fellow Christina Mirarchi is earning her master’s degree in education at the University of Notre Dame in the University’s Alliance for Catholic Education (ACE) program while teaching middle school in Atlanta, Georgia. Chemistry graduate and fellow Isabella Goodenough is pursuing a Ph.D. in chemistry, with a focus in physical chemistry, at Temple University in Philadelphia. Chemistry graduate and fellow Rachel Troxell is pursuing a doctorate in physical therapy at the University of Pittsburgh. Biology graduate and scholar Christina Freeman holds a post-baccalaureate research position at the National Institutes of Health in Bethesda, Maryland. 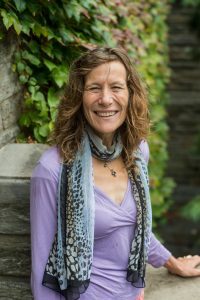 Biology graduate and scholar Kathleen Logan is a fellow in ACE SJU, earning a master’s degree in secondary education while teaching in Philadelphia. Chemistry graduate and scholar Heidi Kurn accepted an internship as a medical assistant at Pennsylvania Dermatology Group in Huntingdon Valley, Pennsylvania. Biology graduate and associate Courtney Hulbert is completing the second half of the SJU 3+3 physical therapy program at Thomas Jefferson University in Philadelphia to earn her doctorate in physical therapy. This past summer, Professor of Physics Paul Angiolillo, Ph.D. ’78, was named director of the program. He welcomed the newest cohort of McNulty Scholars, members of the Class of 2020 in the fall, including scholars Annamarie Glaser, a biology major from Starnberg, Germany, and Lindsay Miller, a mathematics major from Mount Royal, New Jersey. This year’s associate is biology major Amelia Bielefeld, from Saratoga Springs, New York. Eight additional women from the Classes of 2017 and 2018 were selected as fellows for the 2016-17 academic year.